The world of Vaporum is not only comprised of the mysterious tower somewhere in the middle of an ocean. The Arx Vaporum (the Tower) is just one part of a larger world, and various bits and hints on this world lie hidden in the tower’s depths, in the form of readable notes and audio phonodiaries, waiting to be found by the players. In an unexplained way, we just received a scrap book filled with snippets of newspapers from that world. Maybe a teleportation system malfunction…?! There’s no explanation of that in the snippets. However, thanks to them, we can take a peek into this world. 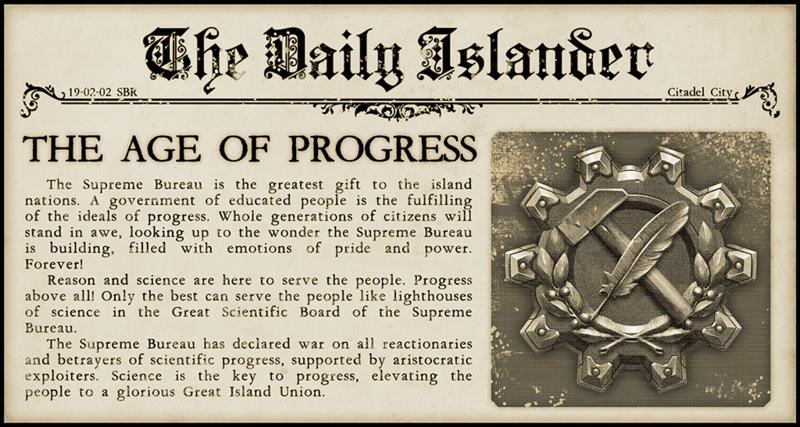 A world ruled by a strictly bureaucratic, science-powered government of the Supreme Bureau. The oldest snippet comes from almost 120 years before the events of Vaporum, from the time when the Supreme Bureau just assumed power.